Poker isn't a race. The winner of last month’s Memorial Day Freeroll Tournament at Juicy Stakes Poker thinks the key to winning tournaments is patience. He advises tournament players to wait for the best hands to bet on, and to hang in there until less serious players to be eliminated. “It was almost half way through the tournament when I thought that this could actually be a good possibility to go far. Ante was 75 with blinds 400/800 and I am in late position with around 12-13K in chips. A guy in early position goes all-in with his around 7K, it is folded to me and I picked up Jacks and made the call. My Jacks hold against his pocket 5s. After that hand I am at around 21-22K and have played good poker so far." The winner said his goal is just to become a better player and then go on to play bigger tournaments. His recent freeroll tournament win at Juicy Stakes was a very good start. 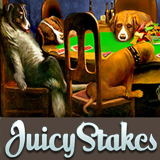 Juicy Stakes Poker is well known all over the world for its online poker tournaments and generous reload bonuses. It offers Texas Hold’em, Omaha and Omaha Hi-Lo as well as new no-waiting “fast fold” tables.